The 14th edition of the International Festival of Pan African film (FIFP) will kick off on April 5, 2017 in Cannes. Each year, the festival pays tribute to movies from the broad African diaspora. In 2017, the focus will more specifically be on African American independent cinema with the theme “USA: yesterday, today & tomorrow”. American Directors represent more than 30% of the selected works this year. 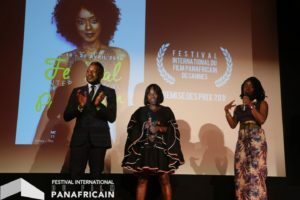 The Festival will as usual offer a wide choice of films from Africa and its diaspora, as well as from the rest of the world. Program: feature films, fiction and documentary, conferences, workshops, showcases, exhibitions as well as a Salon PanAfrican (market) with professional exhibitors and includes areas dedicated to pan-African culture. The event will open with “Everything But a Man”, by Nnegest Likké, at the Palm Beach. As ever, the event will be MC’ed by the man behind the event for so many years, Basile Ngangue Ebelle (photo). The combination of movies, shorts, fashion, galas and music make for a very vibrant event each year. For details, visit the FIFP site.